Back in mid-March, we posted an article about sending your name to the Sun on the Parker Solar Probe. The probe successfully completed a round of tests mimicking the conditions the spacecraft will face in space throughout its seven-year mission, including checking the spacecraft’s functions under hot and cold extremes, cycling the temperatures in a thermal vacuum chamber back and forth between hot and cold, making sure Parker Solar Probe’s systems and components operate properly. Parker, shown here inside half of its fairing in Titusville, FL, went through its final encapsulation at Astrotech Space Operations before its move to the Cape Canaveral complex. Parker’s launch vehicle will be a United Launch Alliance Delta IV Heavy., the second largest payload delivery system in the world. Only the new SpaceX Falcon Heavy is larger. The Delta IV uses two liquid fuel boosters and a second stage to achieve orbit. The first stage and two boosters produce 710,000 pounds of thrust each. That’s a lot of horsepower. The probe is designed to travel through the Sun’s corona, the outer layer of its atmosphere, at a temperature of 2,500 degrees F, 4 million miles from the Sun’s surface. The shield protecting the four groups of instruments is like nothing designed before. The probe will travel at a speed of about 430,000 mph. The Parker Solar Probe’s launch date is now set for August 11, 2018. Stay tuned as we get closer to launch date and thereafter. We’re sure you’ll want to know more about the Sun as the data comes in. I’m sure everyone has heard the name Leonardo Da Vinci, an extraordinary man in anyone’s book. As one can easily see by his drawings (below) of the late 1400’s into the early 1500’s, he was a visionary. Many “modern” inventions sprang from his concepts. Consider his concepts of flight, warfare (a tank and a submarine), his knowledge of the human anatomy, botany and the list goes on. One that you may not know, or suspect, was astronomy. He even has an astronomical effect named after him. Have you ever noticed the crescent Moon within a few days after a new Moon and you can actually see the entire face of the Moon in subdued light? Leonardo was the first one to offer a theory on the phenomena. He believed the “glow” of the unlighted portion of the Moon was due to a reflection of Sunlight off the Earth. And he was right. Hence, this is now called “The Da Vinci Glow”. As with his other many ideas, this one is recorded in his “notebook”. So, if you didn’t know, you can add this to your list of astronomy trivia. For more information and a nice picture from Iowa, visit www.SpaceWeather.com. And the next night or two will be the time to watch, otherwise, you’ll have to wait until the next new moon. Want to take a trip to the Sun? Maybe you can’t go, but here’s how you can send your name. NASA is inviting people worldwide to submit their name to be placed on a microchip on the Parker Solar Probe to be launched in the Summer of 2018. NASA is inviting people around the world to submit their names online to be placed on a microchip aboard NASA’s historic Parker Solar Probe mission. And your name will go along for the ride. Register now and send your name to the Sun. Deadline is April 27, 2018. 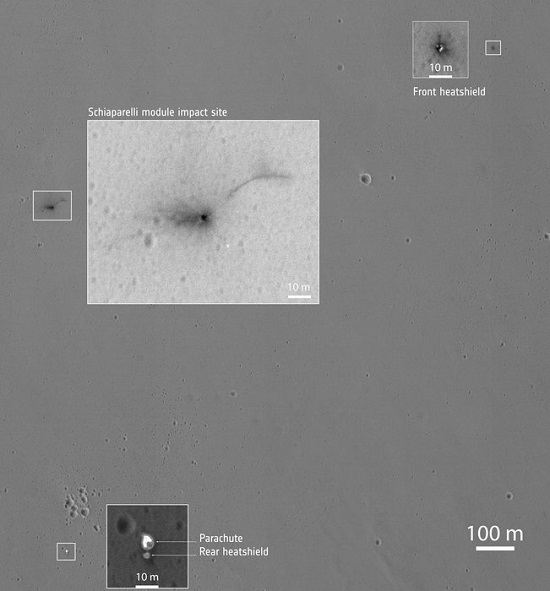 Why did the Schiaparelli probe crash? Posted on May 25, 2017 Author matthewCategories otherLeave a comment on Why did the Schiaparelli probe crash?